It goes without saying that Michigan is a pretty big place. In recent years, it has also become home to a thriving economy once again, which has manifested itself in the form of a lot of new businesses opening. Whether independent stores or franchises, and whether they’re dealing with financial, leisure or food services, we’re constantly surprised by just how many fresh additions there are on the commercial scene. That applies not just to Detroit, but to nearby places like Auburn Hills, Bloomfield Hills and Troy too. These businesses might vary massively in terms of their size and specific industry, but every single one of them has three things in common. Firstly, they’ve got physical, commercial premises. Secondly, those premises have windows. Thirdly, those windows need cleaning! How’s that for some cold, hard logic?! All joking aside, commercial window cleaning is obviously incredibly important for every business. Well-maintained windows help to project an aura of cleanliness and professionalism. Both of those are vital for both boosting your employees’ productivity, and making your premises more appealing to first time visitors. As we touched upon earlier, the Detroit metropolitan is a highly-populated place, and we’re definitely aware that we’ve got a lot of competition here at J&M Window Cleaning. There’s certainly no shortage of commercial window cleaning companies for you to choose from. We do genuinely believe, however, that we’re a cut above the competition. There are plenty of different reasons for that… but don’t worry, we won’t get into all of those now! Instead, we’d prefer to focus on one specific trait that we’re extremely proud of: our versatility. There may be plenty of commercial window cleaning companies operating in Troy, Auburn Hills, Detroit and Bloomfield Hills, but many of them are highly specialized. Some have plenty of experience in residential window cleaning, but far less in its commercial counterpart, which really does require a few additional skills. One key example of this is the ability to work quickly and effectively whilst not disturbing the important work that’s going on. This is something we’ve trained ourselves to do here at J&M Window Cleaning. Hire a specialist residential window cleaning company, however, and you might well endure a difficult and distracting day at the office! Elsewhere, there are companies out there who are experienced in commercial window cleaning… but only on certain types of building. Some might be fine with one or two-story buildings, for example, but struggle on taller structures. Others could be comfortable cleaning windows in an office, but lack the ability to do a good job somewhere like a café or restaurant. Here at J&M Window Cleaning, we have no such limitations. 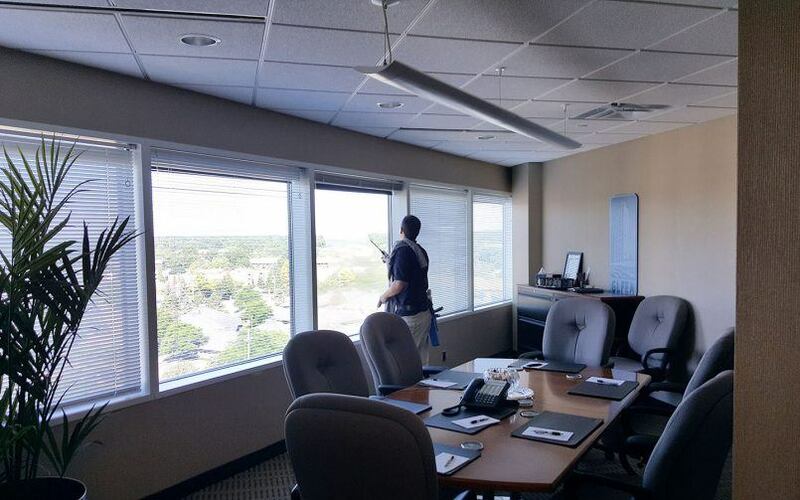 In our 15 years-plus of experience in Troy, Detroit, Auburn Hills and Bloomfield Hills, we’ve carried out commercial window cleaning on every type of business you can imagine, multiple times over. Whatever the specifics of your particular commercial operation, we’ll swiftly be able to analyze what needs doing, and subsequently carry out the work with speed and skill. So, if you’d like to make a booking with Michigan’s most versatile commercial window cleaning company… go ahead and do so! You can contact J&M Window Cleaning by calling (248) 605-2243, or by emailing CleanWindows@JMWindowCleaning.com.